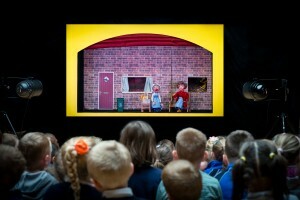 Our marionette version of Red Riding Hood has gone down a storm with junior primary schools across the country. Younger children never tire of hearing their favourite fairy tale – even better when it has been subjected to the “Moon & Sixpence” effect, featuring their own teachers! This version of the ever-loved story, complete with sing-along advice to the characters, also includes a message on picking up litter and recycling. It is really wonderful to see children react to live entertainment in the same way as their parents and grandparents did – despite the extent to which they are subjected to screen-driven inactivity.